Living without money is a fun thing to do. It challenges you to live beyond the limits the current society imposes and it makes the best of you come out. How will you still eat, where will you sleep, how do you move around? For a while now I am running a website in Dutch that covers these topics, and I provide examples of people living this way. The website is becoming a nice success, with around 5000 visitors a month. For Kasper this was a clear sign he wanted to bring the website over the language border and make an English version of it. 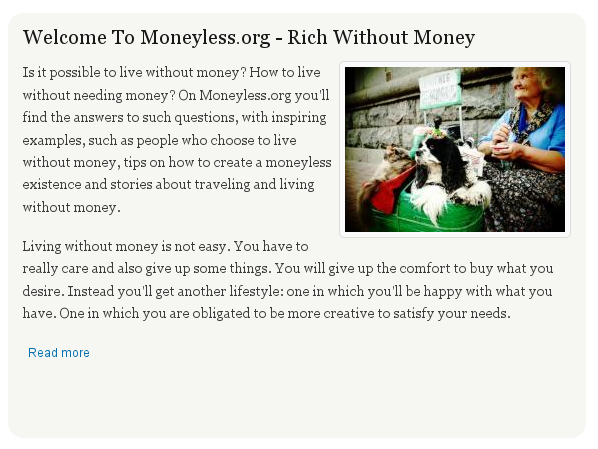 And so here it is: Moneyless.org. 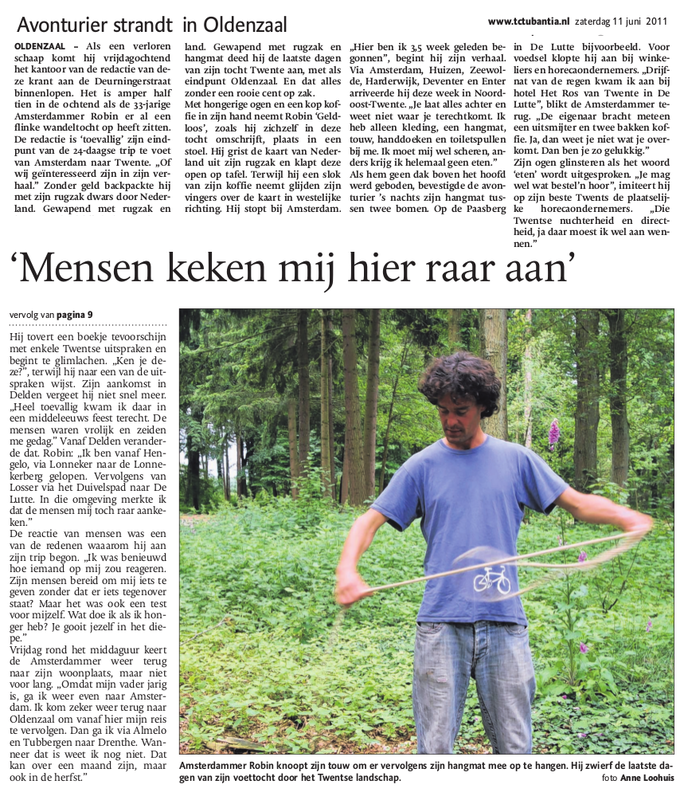 It is still fresh, and it isn’t as well covered as the Dutch version, but with every new article it will become a better guide on how to live a free live without money. For a little over three weeks I walked through the Netherlands, from the west to the east, from the city where my house is at (Amsterdam) towards the German border. And it was fabulous: the things you learn, the people you meet and nature that you reconnect with. Most of the nights I slept in forests, of which there are surprisingly many around, falling asleep in my hammock around sunset and waking up by birds before sunrise. After three months of money-less travelling in Portugal last year and now these three weeks of walking in my home-country (of which people said it would be “impossible”) I am getting better adjusted to it: the hunger you can feel sometimes, dealing with desires of the things you want and surrendering to whatever life brings you, at any given moment. And the funny thing, the more I experience it, the more I actually want it, because of what you learn from it. As such any experience is neither negative, nor positive; they are just life. And as such they are equal to the joy you feel when people give you food, invite you for a coffee or take you in their homes. People’s responses are equally worth it. Some envy me, others think I am crazy and again others simply reject my life, seeing it as a threat to theirs. “Why don’t you go home and make money instead, you’re a fool!”, was one of the most extreme responses that I received. Most people though have a lot of respect for my decisions and thanks to them (and the occasional dumpster treasure) I’ve enjoyed breakfast, lunch and dinner at fast-food restaurants, exclusive hotels, lunch-rooms, as well in the intimate spheres of people’s homes, after variations of the introduction on the top of this post. And so far I’ve never ever really had, what you would call, ‘hunger’. Every step I take is another challenge, every step is one that carries me further towards life and at the same time one that brings me closer to understand the self. And it ain’t over yet. This country has a lot more to explore. When I don’t know yet, but this is to be continued… from the place I left it – but I am sure that by then we will already be further. The cars go about their own lives, the people in the metallic boxes do not see me and just follow their own routes. Unconcerned about this guy who smiles kindly to them and waves occasionally. “What does he want from us?” their eyes seem to say. Some wave back, bringing their hands up to their shoulders and shrug, but the only ones that actually do stop are locals who have nowhere to go but who are kind enough for a chat. “He probably needs help,” is what they think. There are times when you are totally surrendered to a situation. That you know there is nothing else to do but to wait and to do nothing. Nothing. You can only do nothing to change the situation. Feeling pressure is futile, it will only make the situation harder to digest. Pressure only stays in your head, making your thoughts repeat in circles. To resign myself and fully accept the situation as it comes to me, is the only option I have to stay healthy, and positive. Also on this day, while waiting to cross the border to France and my last rice cookie is behind my teeth. I chew it slowly until it has disappeared fully. I think about eating more. The roadhouse in front of me, next to the petrol station in the Catalan Pre-Pyrenees twenty kilometers before the French border where I have been now for nearly 24 hours, is about to close in some hours. Shall I just go in and ask for some food? No, I decide. Last night they already gave me a baguette with cheese and a large cake that I used for breakfast. If they would like to give me more, they will offer it to me, as they know I am here, and what I am here for. I slept well. A wonderful night I had and I look back, full of satisfaction. I arrived here at the end of the afternoon after some fantastic days but I could not find a car to pick me up. Behind the petrol-station in a small wood was the perfect piece of land for my tent. Moreover, it was full moon and thanks to the light that a full moon gives, the view over the mountains and the river that flows towards Barcelona, had been great. Now I am walking back and forth the rest-area. I’ve been awake for more than eight hours now and I don’t think much. Instead I do my walking meditation: I put my attention to the movements of my body and my breathing. Rest settles over me like a warm soft blanket and the trust remains, that everything will be fine, even though people ignore me and my almost empty belly. While walking I leave the luggage behind at the outlet of the pump and decide to sit on the rocks in front of the restaurant, without illusions. I keep myself quiet, am not even sticking my thumb up anymore. Until I suddenly see two guys walking towards my luggage, inspecting it, picking up my bag, and starting to walk away with it. I laugh at this interesting situation: would they like to also take me if they know I belong to that luggage? Unfortunately not. They excuse themselves in French. They thought that the luggage was left behind by the motorcycle club who had just been here. “But maybe you can take me across the border?” I ask. They say that our roads are not the same and leave me standing behind, puzzled a bit. They drive away with two French cars. In the second car I see a free spot, besides a beautiful girl smiling at me and who gives me a curious look. Another story that is not supposed to become one, I say aloud to myself. And I sigh. Then after half an hour a Dutch car arrives. Let’s check the state of solidarity, me being from that country as well. He goes the other way. “Otherwise, I would definitely haveÂ taken you,” the man says kindly enough and sincerity speaks from his eyes. So I will have to hold on, but for how much longer? Will I sleep here another night, but this time feeling hungry? More than one hour later, yet another Dutch car arrives, this time with a caravan. Is this it then? Is this my ride? Will I finally be crossing the border? A woman gets out of the passenger door and walks into my direction. Beside the caravan we have a chat. I explain to her who I am and why I’m here. And this is when the miracle happens: she is fine with bringing me across the border, “If my husband is so too”. And he is, although they “normally don’t take hitchhikers”. I hardly know the joy I feel, after nearly twenty-four hours of waiting and I walk back to the woman, telling her the good news of her husband agreeing, and she looks at me and says: “We first wanted to have dinner at the restaurant. Would you like to have some food too?” How could she tell?! I hadn’t even old her anything about my way of traveling, apart from the hitching. The next day, after some local wine, nice conversations and a good night’s sleep, they put me on the road in direction Toulouse, and they give me some bread for on the road. I also get a jar of peanut butter to go with it. Peanut butter, how much I had been looking forward to you in the past three months! How I have been yearning to have your taste in my mouth and your energy in my body! So yes, everything does come your way, and the peanut-butter was definitely worth the wait.